What a neat looking quilt, I love it! 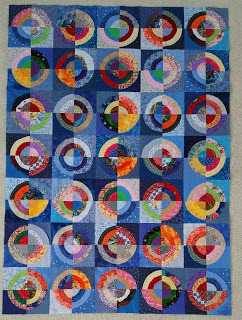 It is a colorful, and energetic, quilt! Congrats! That looks fantastic! Obviously cutting up the blocks was the right thing to do. It has great energy. I really like this pattern, looks difficult but interesting. Glad that you got to finish it up, very nice. That turned out great - sometimes when you win blocks it can be a real challenge because everyone pieces a little differently, but you sure made lemonade out of them by slicing them up and swapping them around.